I've said this before, but our office bake-offs are definitely one of the highlights of my job. However, I realized last night, amidst the panic of discovering my bananas weren't quite brown enough or soft enough for awesome banana bread, that I don't enjoy baking for competitions. I spend time in the kitchen for pleasure, to cook (or bake) what I want, when I want. No more bake-offs for me, but I'll gladly have you over for dinner anytime. I didn't win the bake-off, but I haven't lost faith in my go-to banana bread. I tried out a new, totally optional, crumble topping to up the anti for the competition - definitely a winner in my mind. 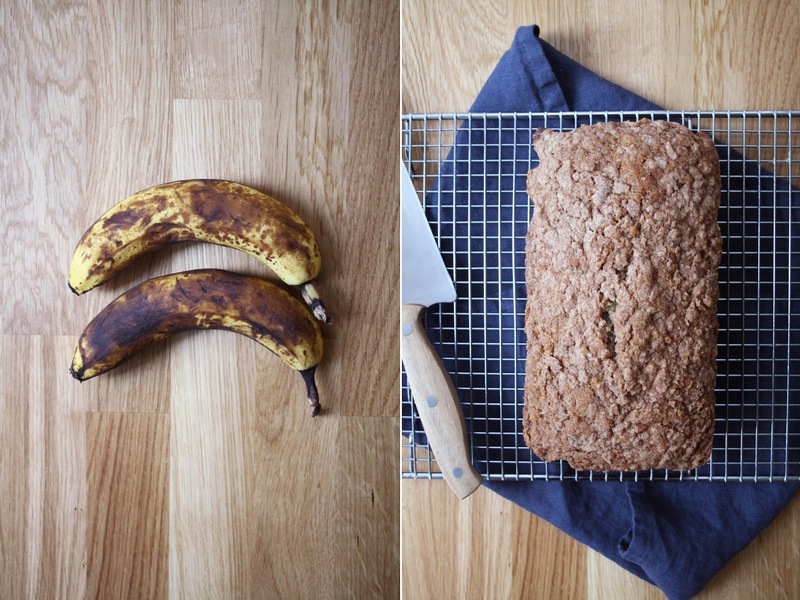 *Note: If you don't have ripe bananas, be patient - truly ripe bananas make the BEST banana bread. If you're impatient, simply pop your bananas onto a tin-foil lined baking sheet, and roast in a 300 degree oven for 1 hour. Allow to cool for 10 minutes before handling. In a large bowl, smush the ripe bananas. Combine the crumble ingredients in a small bowl, using your fingers to work it all together. Pour batter into a parchment lined loaf pan and sprinkle with topping. Bake for 35-45 minutes (check at 30) until a toothpick comes out clean. Allow to cool in the pan for 10 minutes before transferring to a wire rack. Resist the urge to eat the bread while its hot, allowing it to cool completely will let all the flavour soak in.